By Felicity Arbuthnot: Although the US’ entirely illegal attack on Syria’s Shayrat Airbase in response to an alleged chemical weapons attack by the Syrian government, showed not a thought towards Congressional debate, United Nations mandate or the rule of law, it seems that some thought might have gone in to the date. A reminder: On 12th September 2013 Syria’s President al-Assad committed to surrender Syria’s chemical weapons, with the caveats that the United States must stop threatening his country and supplying weapons to the terrorists. Further, “We struck a deal where we got 100 percent of the chemical weapons out”, Kerry said on NBC’s “Meet the Press” in July 2014. Kerry was referring to the deal between the U.S., and Russia in September 2013 in which the Russians agreed to help remove and destroy Syria’s entire chemical weapons stockpile. Trump is shortly to embark on a State visit to Israel. International law, the UN Charter, diplomacy has been damned, ditched and shredded by yet another self appointed “leader of the free world.” The attack on Syria another US illegal assault on a sovereign nation. What there is evidence of is that the US indeed used both chemical and radiological weapons – fifty nine times – in their attack. Tomahawk Cruise missiles used in the attack are thought to contain Depleted Uranium (3, pdf.) “Toxicity of DU is both chemical and radiological …” states that International Atomic Energy Agency Document. University of Michigan reported, “The epidemic of birth defects in Iraq” Dr. Muhsin Al Sabbak, a gynecologist from Basra Maternity Hospital, and Dr. Mozhgan Savabieasfahani, an environmental toxicology researcher, reviewed the ever-growing mountain of data showing that rates of cancer, child cancer and birth defects (BD) have reached unprecedented levels in Fallujah and other Iraqi cities since the 2003 US invasion. US Central Command has acknowledged that DU was fired on two dates – the 18th and 23rd November 2015 … 5,100 rounds of 30 mm DU ammunition were used by A-10 Thunderbolt II aircraft. This equates to 1,524 kg of DU. (International Commission to Ban Uranium Weapons, Oct. 21, 2016) Emphasis added. Further: “DU is a … radioactive waste and therefore, must be deposited in a licensed repository.” Same source, p 154. Note: “ … a licensed depository.” Not on a school, home, street, farm, Mosque, church, university, hospital, village, town or city. “Short term effects of high doses can result in death, while long term effects of low doses have been implicated in cancer.” (Kinetic Energy Penetrator Long Term Study, Danesi, 1991.) Emphasis mine. So let’s have no more self righteous nonsense over something entirely unproven the Syrian government are being accused of when the US itself has been using chemical and radiological weapons for twenty five years, it’s own Army manuals warning of the dangers. The soaring cancers and birth defects linked to the use of DU in Iraq and where ever else they have been used – mirrored in US servicemen, women and families are chilling proof of the voracity of the warnings. DU has a half-life of 4.5 Billion years. Its use condemns and curses the not yet even conceived – until the end of time. Donald Trump, thus had a chance to turn a new leaf as new President, make good his promises on avoiding foreign interventions with concrete initiatives already in place to endorse and build on. Further, it was widely reported that thirty six of the Cruise missiles are unaccounted for, where did they land, who did they kill, or are they lying at the bottom of the Mediterranean decaying, to poison it’s waters and life for all time? 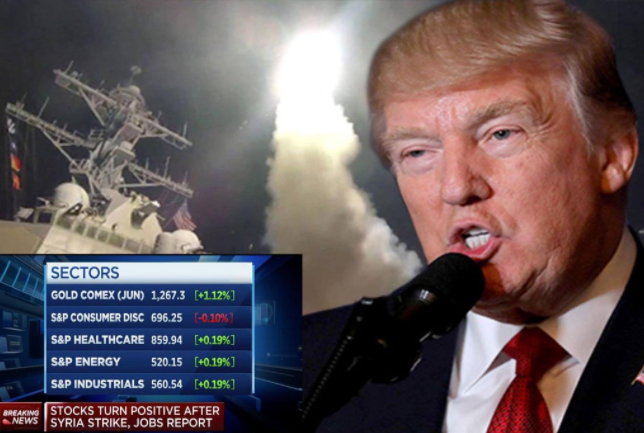 “Tomahawk missiles are manufactured by Raytheon Inc., and according to this report from Business Insider (link), Donald Trump owned stock in Raytheon up through at least the start of the presidential election cycle. There is no record that he subsequently sold that stock.